Way back when (okay, a couple of weeks ago) I posted our new FREE Video Bootcamp for Teachers and Trainers– 5 hours of classroom lessons you can use with your students/employees to make their video better. Since then, I’ve received more than a few complaints about posting it on Scribd.com. I thought it made it convenient and look kind of nice on the blog, but I’m told it’s hard for people to download the original PDF. Problem solved. Download the PDF right here, right now. Nothing to buy, no email address to leave. Click this link to download the Video Bootcamp PDF. And please feel free to share the link– or download and email directly to your favorite teacher! Steve, I love your book! I'm going to make it required for my Digital Marketing class. I'll keep you posted on how it goes. This is great. I've been looking for something to help me with my videos. Thanks! That is an awesome resource for teachers. Often, it is hard for "old fogies" to keep up with technology. But, as we all know, video is "everything" now. Kids LOVE to watch video and what better way to integrate what they love with what teachers love (to teach). We incorporated a professional video for people looking for singing lessons in honolulu and might have to make some instructional videos for students to watch on their own time. OK, I'll stop blabbing:( Thanks again for the resource! Great! Please share! And if you (oh reader) ARE a teacher, I’d love to know if you’ve used the lessons and how they worked for you. 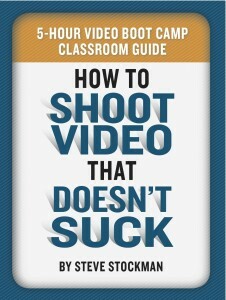 Great book, learned this as I read and attended a Video Production class. Luckily 720p looks pretty good on anything smaller than a 40″ screen! There’s no right or wrong answer for video resolution– it always depends on what you’re shooting. But yes, 1080 does seem like a good set-it-and-leave-it-there standard for now. I finished reading your book yesterday. 2. Beginning, middle and end – this is also what Steven Pressfield talks about while writing screenplays. (something special about the name Steven, haha). I will be using these techniques in shooting my videos (usually self shot).